It isn't always easy being a moose but this young moose has a special, joke-telling friend to keep him company and to help him find his way. Join Moose, Magpie and some of their other animal friends as they frolic through a year of changes. Learn what the Liberty Bell and moose have in common or why moose cross the road. 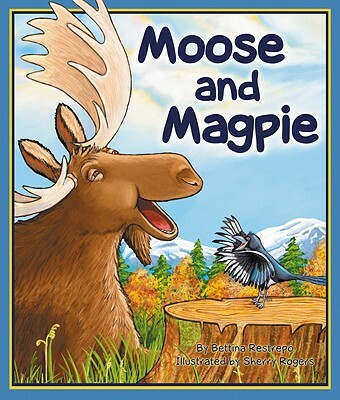 Laugh along with Moose and Magpie, and learn something while you are at it. The -For Creative Minds- educational section includes: Is it for real?, Moose and birds, What do moose eat?, Match the moose body part to its adaptation, Moose life cycle, Moose antlers, and Moose fun facts. Sherry Rogers spent twelve years as a corporate graphic designer and artist before -leaving it all behind- for the freelance world of illustrating children's books. Through illustrating The First Fire, Sherry remembers her own ancestor, Na Ni, a Cherokee woman from the mountains of North Carolina. Some of Sherry's other Arbordale titles include The Penguin Lady, Ten for Me, Hey Diddle Diddle, Newton and Me, Moose and Magpie, Paws, Claws, Hands & Feet, and The Deductive Detective; as well as her award-winning titles: Sort It Out!, Kersplatypus, Burro's Tortillas, and If You Were a Parrot. Sherry lives in Northern California with her family and their pets.